This is a bit of a ‘hello world’ post. I am not sure what I am supposed to write really. But that’s how all writing starts, isn’t it? I suppose I should start with what this is all about, or perhaps I should start with why. Then again another sip of wine might be a better step! 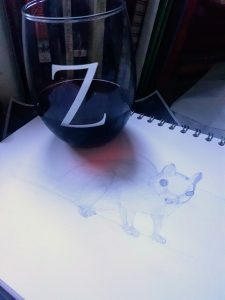 One of the ninja squirrels and my glass of red wine. So where to start? Ah yes, writing. That’s what this is about, a place for my writing to breathe into the world. I am a firm believer in the philosophy that everyone has a book in them. I have always had a head full of strange and (I think anyway) wonderful stories. Last year I decided to go back to university to see if I could learn how to write them down. Well I am about to start my second year at uni, and now feeling braver I thought it time to make some of those stories public. So far I have only added two pieces, my poems from my coursework last academic year and also my fiction piece too. Leftovers, the fiction short story, achieved a first and some very encouraging comments from my tutors (all published writers in their own rights). I won’t reveal too much here, but it was inspired by some of the individuals I passed daily on my walk to the office in Holborn. My next posts will probably be more fiction as that is what I am planning to focus on. I found poetry a little too tough, although it scored well I don’t think I understand it enough. It is a good outlet for emotional ramblings though! Watch out for the ninja squirrels, they are everywhere – more to come on the origins of the site title and the above drawing later.